We did a Lumiappaday. this morning already, but as I mentioned, we will be doing more than one on some days to get the whole collection of apps I’ve got so far (as well as the new ones). This app we’re looking at should really be there by default but it’s not and saying it already that you should download it straight away for your Lumia if you haven’t already. 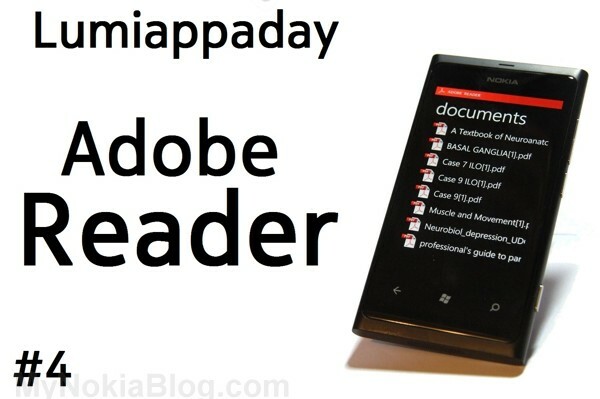 This app of course is for reading PDF files. You get a list of PDFs which are on your phone and they open up just like most PDFs. It’s simple and does the job. Design: 8 – it’s clean, simple, not much to expect really. List view cannot be viewed in landscape, though of course, the documents themselves can. Usability: 7 – it’s all just very simple to use. Just tap, open, swipe to next pages, pinch zoom or double tap to zoom in and out. I like how I can zoom in on pages very closely which helps when I have slide hand outs. I can’t do that on my touchpad. The 800X480 display (like on the internet tablets of old Nokias and N900) really make it more pleasant to view the smaller text. You can of course smoothly pinch and zoom the text. The whole document can be viewed in full screen in landscape or portrait. My main gripe is that there’s no function to go to a particular page. That’s a problem I have also on my touchpad. This is an issue for me since I have some textbooks in PDF format. 1000 page+. I am not swiping to page 800. I think my N8 had this function but it was difficult to read and was a touch slow. I’m going to assume that most folk will be using smaller sized PDFs? It also doesn’t do search for words. Perhaps it would be nice to do more than delete the PDF’s? Maybe send them? I like that downloading PDFs online opens up Adrobe Reader automatically and saves it automatically for later viewing. I don’t like however that it’s rather difficult to transfer over files on my PC. Emailed PDFs are great, and as you can see in the video I used Box.net (I also have dropbox) to sync files over anyway. Actually that’s how I’ve been transferring documents from my PC to my mac as it was just convenient having this one place to access all my files from. Price: 10 – Free. No ads. Yay 😀 We will be covering paid apps. Don’t worry, not everything will get 10. (And not all free apps immediately get 10. It’s whether it was a worth download, whether the ads were intrusive and affected the app in anyway, and if a paid app was very well priced, it could get 10 too). Conclusion: It’s a must install. It should be preinstalled. « Nokia Lumia 800 takes two top 3 spots in Vodafone’s Most Popular page?